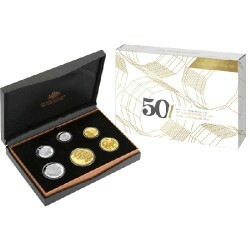 2015 Decimal Coins There are 116 products. 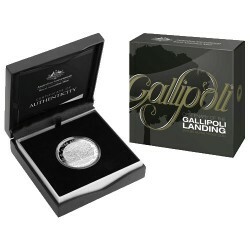 2015 $5 Centenary of The Gallipoli Landing Silver Proof Coin. In 2015, the 100th anniversary of the first Gallipoli Landing will be marked with the release of two new collectible coins. 2015 $5 ANZAC Centenary Silver Proof Triangular Coin. Anzac Day 2015 will be an especially poignant even for Australians and New Zealanders, the 100th Anniversary of Gallipoli and the ANZAC legend. 2015 $1 The Spirit Lives Across Australia – Australia Counterstamp Coin. The deeds performed by the countless men and women who stepped forward to serve the cause of peace and freedom during the First World War, fostered a legend still alive today. 2015 $1 Back to the Future – DeLorean 1oz Silver Proof Coin. Thirty years after the box office success of Back to the Future, Perth Bullion Company has released this 1oz Silver Proof coin to celebrate the 30th Anniversary. 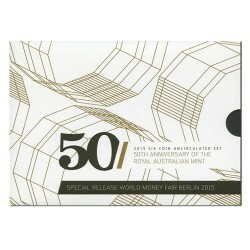 2015 Mint Set – 50th Anniversary of the Royal Australian Mint. 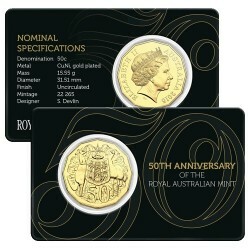 The annual tradition of year sets of Australian coins continues and in 2015 marks a very special milestone for the Mint. 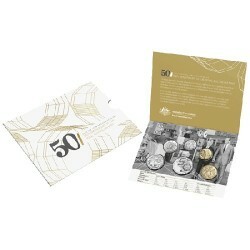 The golden anniversary, this uncirculated set celebrates 50 years of producing coins which have been collected and cherished by generations of Australians. 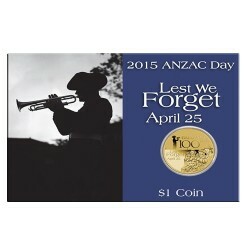 2015 $1 ANZAC Day Uncirculated Coin in Card Anzac Day – April 25 – remains a deeply significant commemoration, honouring the military service and sacrifice of the Australian Defence Forces. 2015 $2 Remembrance Day ‘C’ Mintmark Coloured Uncirculated Coin in RAM Card. After perfecting the craft of producing spectacular colour printed coins in recent years, the Royal Australian Mint has just released the nation’s next coloured circulating coin in honour of this special commemoration. 2015 $2 Lest We Forget ‘Poppy’ Counterstamp Coin The deeds performed by the countless men and women who stepped forward to serve the cause of peace and freedom during the First World War, fostered a legend still alive today. 2015 $2 Remembrance Day Lest We Forget Uncirculated Coin in Card At 11am on 11 November 1918, the Armistice was enacted and the combat across the battlefields of the First World War ceased. After four long years of conflict, the world was once again at peace.